Last month, I bought my first four nail colors from Pretty & Polished. Chelsea Marie hand makes every polish, fulfills all orders, and inquiries herself. For this post, I'll tell you about my personal experiences with her shop and my review of Jawbreaker. Out of all the releases I've seen up to date and the four polishes I've purchased and tried thus far, I do think that Jawbreaker is the most creative nail color Pretty & Polished has to offer. Its namesake is perfect for how it looks in the bottle and on the nails. It has a milky white jelly base with tons of different glitter, and the formula is the best I have ever tried to date. I used three thin coats on my fingers, but opacity can be achieved with two generous coats alone. On my thumb, I tried layering Jawbreaker over a sheer pastel pink color called Kim-pletely in Love and only used one heavy coat of Jawbreaker. My favorite aspect about the formula is that it mostly settles on its own, which eases application for someone like me. Up until this review, I've placed four separate orders, but I'm only going to talk about three of them. The first two were within the same day because I was looking for Jawbreaker and wasn't able to buy it the first time. I ordered two mini bottles of Hello Dolly and Valentino, then followed up with another two minis of Jawbreaker and Midnight Rider. After my first order, I messaged Chelsea through Etsy asking about Jawbreaker and was informed that she would be restocking it that same night. I also inquired about the shipping difference I would have saved had I ordered everything at once, and she kindly obliged. Given her increased popularity, she no longer offers this service and clearly states so in her shop's profile. Now I will say that with two of my three orders, there has been some forgetfulness on her part. I didn't receive the shipping difference back until I asked about it five days later. Then, with my third order which consisted of another mini and a full size bottle of Jawbreaker, I didn't receive the full size and had to inquire about it. Please note, this is by no means a complaint, I am simply revealing information about my experiences with buying from her shop. I understand that she's gotten quite busy with Pretty & Polished now and acknowledge that she is just one person. Personally, I think she does a great job regarding customer service. She is accommodating, prompt about answering questions, and trustful of her customers in that she did not automatically assume I was lying about having an incomplete order. I originally purchased my mini bottles at 4.50$ each, but they have increased by 25¢ since then. None of my mini bottles seemed to come with any stainless steel balls, so I had to add some of my own to mix up the polishes. Perhaps mine were overlooked, or I really just didn't roll them around enough, but either way, it's not a big deal to me. My full size of Jawbreaker (8.50$) did arrive with two however. I've received all my orders in a reasonable time span, and they've each come with a Pretty & Polished business card (that I'll show you next time). You won't find an invoice included in your package, but I don't mind that since it saves paper and I can just look it up in Gmail. There's also no ingredient list for any of the polishes, but they are free of the 'Big 3' and cruelty free as well. Generally, I consider the smell of Pretty & Polished colors to be very inoffensive compared to others in my stash. A disclaimer (of sorts) about Jawbreaker involves the red square glitter. It seems to be weightier compared to the other glitters so it'll stick to the sides or settle at the bottom of the bottle. 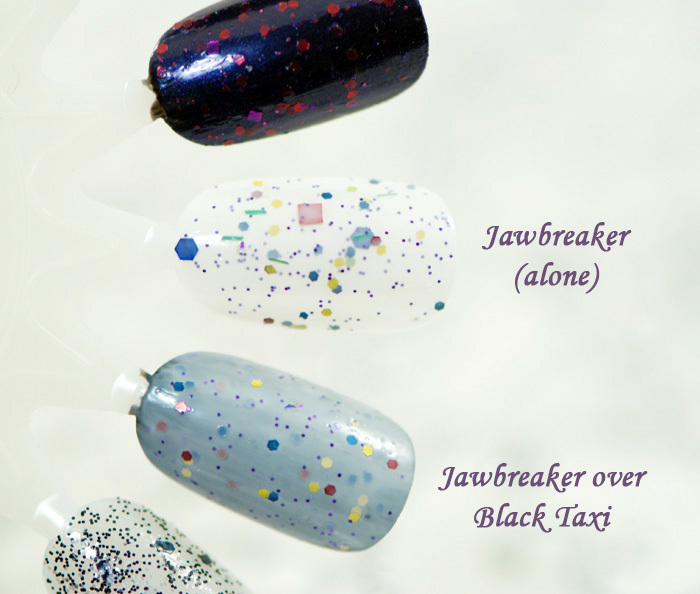 Chelsea notes this issue in every Jawbreaker listing and while she's working to find an alternative, lighter replacement, "try shaking or rolling the polish upside down or letting it sit upside down for a while before using." Given the packaging on both the mini and full size bottles, this is much easier to do with the flat top cap of the full size. The caps on mini bottles have a slight curve that doesn't make propping them upside down impossible, but requires a bit of balancing work. So while testing this polish, I wore it for eleven days straight (over a base coat) and didn't get any chipping and barely any tip wear. I'm sure nail polish addicts won't care for wear that long, but for people who might, how awesome is that wear time?! Trying to shoot photos of the tip wear was actually difficult because of how minimal it was.